Dr. Plantinga is professor emeritus of Philosophy at the University of Notre Dame, was described by Time magazine in 1980 as “America’s leading orthodox Protestant philosopher of God.” He is the author of numerous articles and several books, including God and Other Minds: the Rational Justification of Religious Belief (Cornell 1967), God, Freedom and Evil (Eerdmans 1974), Warranted Christian Belief (Oxford 2000) and Where the Conflict Really Lies: Science, Religion, and Naturalism (Oxford 2012 from which he draws this lecture). Among many honors, Plantinga is the past president of the American Philosophical Association, Central Division, and the Society of Christian Philosophers, and a Fellow of the American Academy of Arts and Sciences. 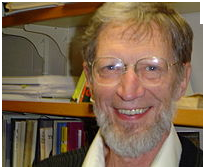 With a PhD in Philosophy from Yale University, Alvin Plantinga is widely known for his work in philosophy of religion, epistemology, metaphysics and Christian apologetics. He delivered the Gifford Lectures three times, was a Guggenheim Fellow, 1971–1972. In 2012, the University of Pittsburgh’s Philosophy Department, History and Philosophy of Science Department, and the Center for the History and Philosophy of Science awarded him the Rescher Prize.